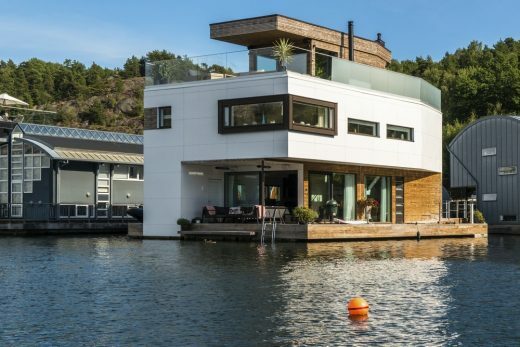 Specialists in floating construction Bluet Ltd and Marinetek Group, have collaborated to create a spectacular floating villa located in Marinstaden, Sweden. 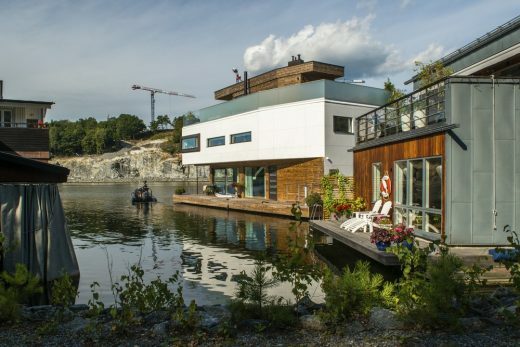 As waterfront developments are becoming increasingly popular, this unique design provides a sustainable option without causing harm to the environment. 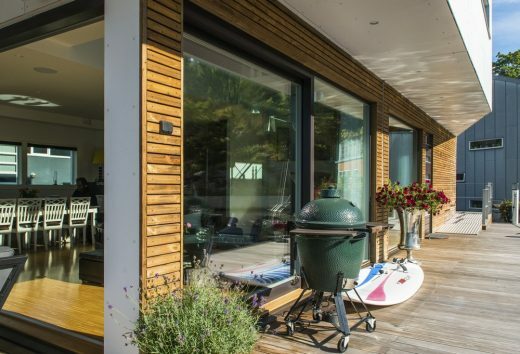 The simple and lightweight wooden structure is clad in Kebony, a beautiful wood recommended by leading architects, ensuring the home perfectly complements its Kebony deck and maximises its sustainability. 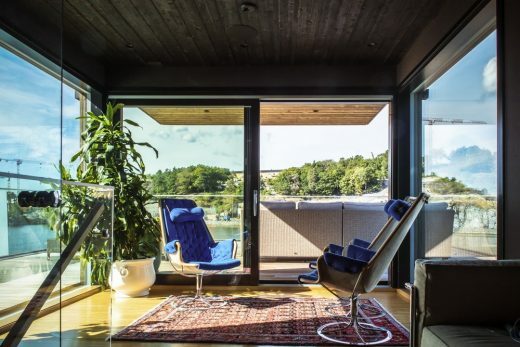 Comprising three floors, the so called ‘Villa W’ embraces a classic modernist design that maintains a strong connection with its natural surroundings. 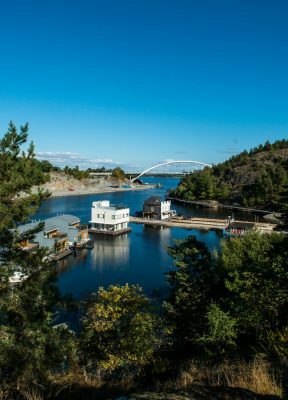 The external façade combines glass, white fibre cement and sustainable Kebony wood to create a property fitting of the surrounding scenery. 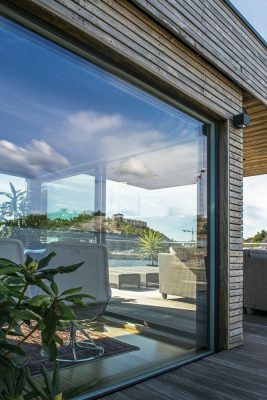 The villa’s large windows make the most of the picturesque scenery, embracing the light that reflects off the sea’s surface. 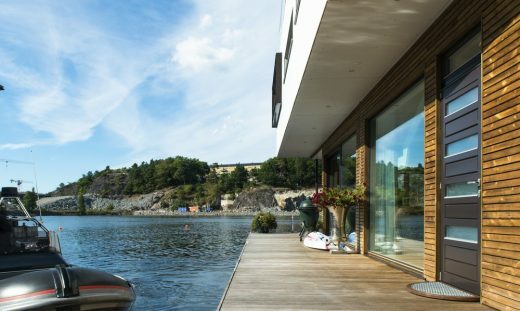 Although compact, this villa has enough space for a family of four, with a guest bedroom and living room at sea level, additional bedrooms and a TV room on the first floor and sauna and sauna lounge on the roof. The simplicity of the house’s external appearance belies the complex architectural process that has gone into its creation. 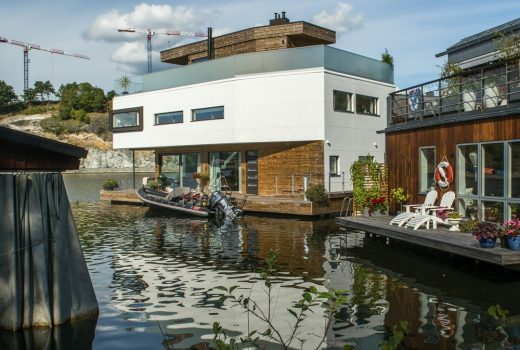 The balance point of the building must fall directly in the centre of the house, despite the irregular shape of its design, to ensure stability and to prevent the house from tipping. 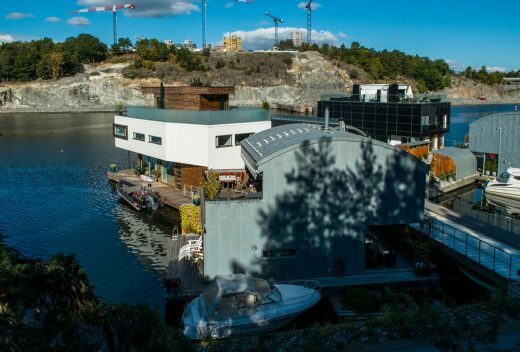 Construction on water has its special requirements, therefore, elements of the house were prefabricated before being placed onto a floating foundation, weighing 160 tonnes and anchored with durable Seaflex solution and concrete sinkers. 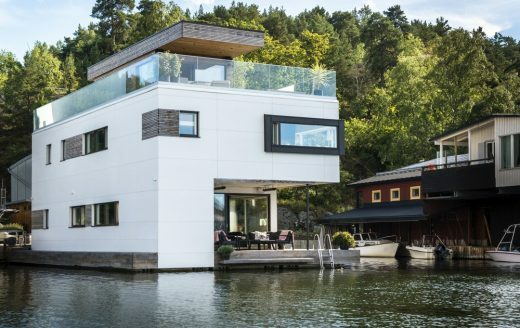 Villa W was assembled ten miles from Marinstaden and towed to its existing location during calm waters. Throughout this build, there were a number of factors that needed careful consideration. 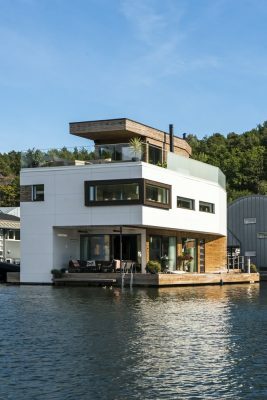 One of which was to source a cladding material that required minimal maintenance whilst being resistant to wear and weathering, a characteristic required given its waterfront location. 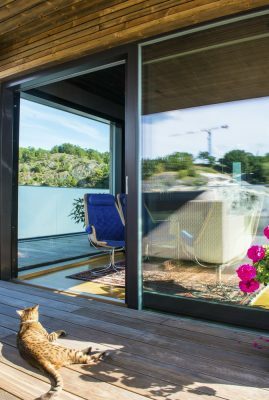 In addition, as this is a house defined by its context in nature, one of the most significant concerns for the designers was to ensure that the villa was environmentally friendly. 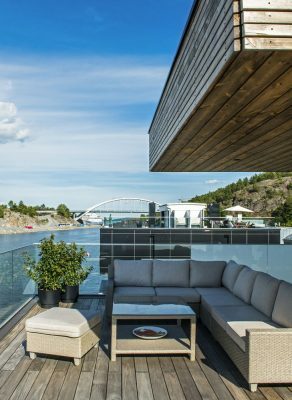 Developed in Norway, the patented Kebony technology modifies sustainably sourced softwoods so that they permanently take on the attributes of tropical hardwood including high durability, hardness and dimensional stability. 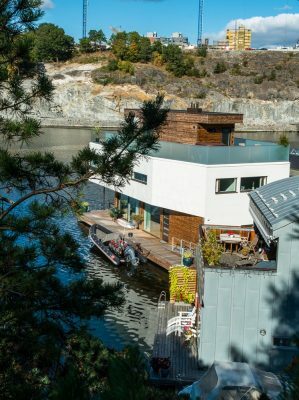 Beyond the choice of materials, the floating home has been designed to make no imprint on the surrounding nature, with the ability to be towed away at any time without impacting the bay.